No, we're not talking about the catchy little South Korean tune Horangnabi here. But don't be surprised if you find a soft spot for this charming 2008 Oceanis 43. 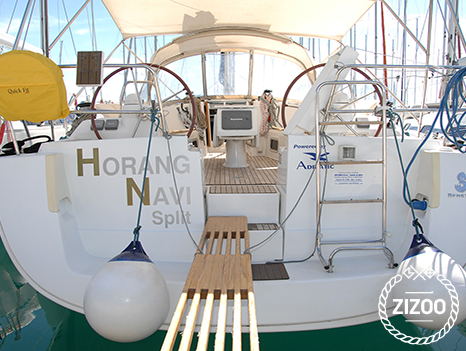 The Horang Navi is based in two different locations, depending on your preference. Set sail from the second largest Croatian city of Split and dance your way, we mean, sail your way to Hvar and mingle with the stars as they show off the latest in beachwear fashions in any of the many renowned bars and nightclubs. Or, depart from Dubrovnik, a UNESCO Heritage Site. Get fabulous views of this incredible city, ranked in the top ten best medieval cities in the world, according to CNNGo. And as you sail away enjoy the comfort of 3 cabins that sleep 6, plus 2 berths in the salon, a fully equipped kitchen and even an LCD tv for those days you just want to stay out of the sun. But for those who want to work on their tans, anchoring in one of many secluded coves and spreading their towels out on deck is probably the best way to go. For all your sailing questions and queries, let your friendly crew guide you.